206 pages | 55 B/W Illus. "Data Science Foundations　is most welcome and, indeed, a piece of literature that the field is very much in need of…quite different from most data analytics texts which largely ignore foundational concepts and simply present a cookbook of methods…a very useful text and I would certainly use it in my teaching." Data Science encompasses the traditional disciplines of mathematics, statistics, data analysis, machine learning, and pattern recognition. This book is designed to provide a new framework for Data Science, based on a solid foundation in mathematics and computational science. It is written in an accessible style, for readers who are engaged with the subject but not necessarily experts in all aspects. It includes a wide range of case studies from diverse fields, and seeks to inspire and motivate the reader with respect to data, associated information, and derived knowledge. 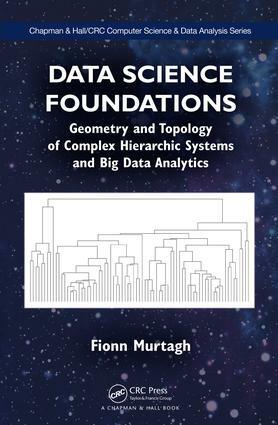 "Fionn Murtagh new book is an advanced text in data science which is highly recommended for those seeking for new directions in the field. From the use of ultrametric spaces for modeling the human mind to the study of narratives through hierarchical structures, this book is thought provoking and intellectually challenging." "Overall, I think this book bring new insights in data science. Many books can be found for the basics of data science. In this book, on the contrary, the approach which is discussed goes a step further. This book is quite technical in some parts and some mathematical background will help the readers to understand the details provided in some chapters. However, since R code is provided, as well as many illustrative examples, practitioners should also find their groove. The book contains many illustrative examples but also theory. It can thus be interesting for readers with different back-grounds. Theoretical-oriented readers will find cues on why it works while practical-oriented readers will find some ways and cues on how to handle their data to get the best of it." "An intriguing book, and one that is set apart from the mainstream "big data analytics" texts, Data Science Foundations is most welcome and, indeed, a piece of literature that the field is very much in need of…. Murtagh presents the geometric ideas of metric and ultrametric spaces in a very innovative way, quite different to the more formal and dry mathematical presentations of these types of concepts. This book is also quite different from most data analytics texts which largely ignore foundational concepts and simply present a cookbook of methods…Geometry, topology, metric mapping, random projections, and applications to chemical analysis data challenge the reader out of the comfort zone of superficial data analytics methods. This is a very useful text and I would certainly use it in my teaching." Fionn Murtagh's very first post after his PhD was educational research at a national level, followed by nuclear energy risk assessment. He then worked for a dozen years on the Hubble Space Telescope, as a European Space Agency Senior Scientist. Following many Professor of Computer Science positions, teaching and research, and senior management positions in Ireland, France, USA and UK, he is very happy now to be advancing data science as Professor of Data Science, and Director, Centre for Mathematics and Data Science, at the University of Huddersfield.